Just two days until the exhibition launch! 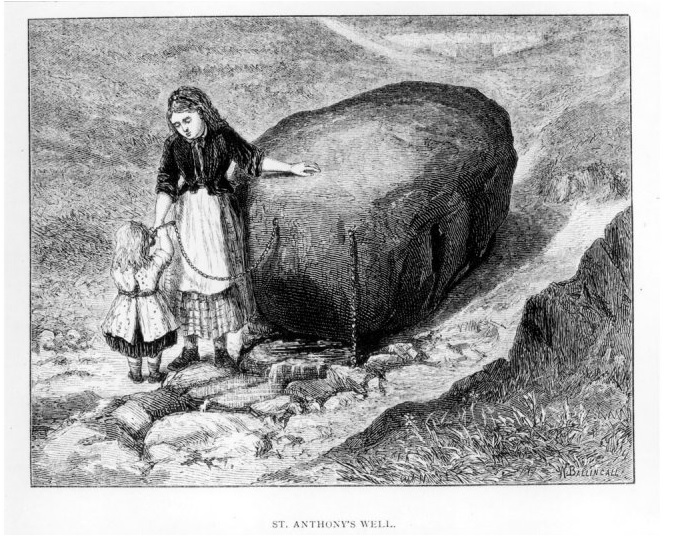 Atzi and I poured a wee libation at St Anthony’s Well – and here’s an engraving from the 19th century showing a mother and child at the same well..
About the Wells of Arthur’s Seat .. Paintings; Rose Strang. Poetry Alan Spence. Cello; Atzi Muramatsu. Back in the mists of time, long before St Anthony’s Chapel was built in the 12th century, St Anthony’s Well was a place of worship, celebration and healing rituals. Descriptions collected from the Victorian era describe how, up to the 19th century, locals would visit the well to enact healing rituals. ‘Clootie Wells’ (or ‘Rag Wells’ as they’re called in England) were places believed to be sacred; this was part of a pan-European way of worship, or faith in nature. People believed that nature held everything in balance; disease or failed crops meant that nature was out of balance; they visited wells to restore balance. To invoke a sacred space they’d walk around the well, in silence, three times (sun-wise as it was called). They would soak the rag in well water, apply it to the afflicted area of the body, then leave the water-soaked rag nearby in the earth or hung on a tree, to be absorbed by the earth or sky. To end the ritual they’d leave tokens such as wild flowers, coins, or iron nails in gratitude. When the more punitive approach of the Protestant Reformation reached its height in the 17th century, religious leaders created laws against these healing rituals, since they were believed to be un-Christian. To be discovered enacting a ritual which invoked ‘magical’ powers could lead to interrogation, sometimes torture and death (at its height during the witch trials of the 17th and 18th century). Yet, locals still attended their wells right up to the mid 19th century. On the 1st of May they’d bathe their faces in the dew at dawn, livestock would be led through the streams for good luck, at dawn or sunset throughout the year, they’d come to the well to pray for healing of the sick or wounded. Water was seen as a place of in-between, the threshold to another world. The religious term might be ‘a thin veil between heaven and earth’. Nowadays we might use the word liminal – a place of change or transformation between two places. 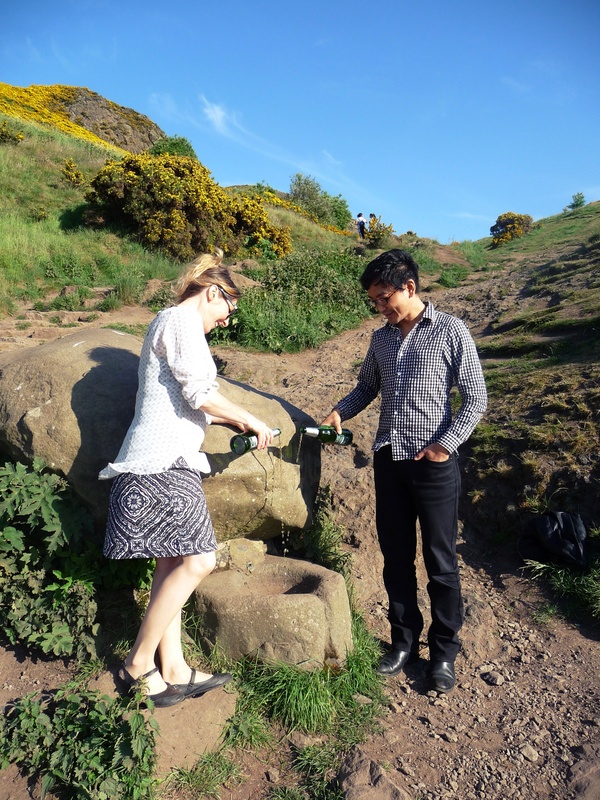 Thanks to dedicated conservation in recent years, the flora and fauna of Arthur’s Seat is flourishing again, much as it did hundreds of years ago. With paintings, poetry and music we celebrate the people who cared for their landscape in ancient times, and the beauty of Arthur’s Seat today. This entry was posted in Uncategorized on June 14, 2018 by rosestrang.